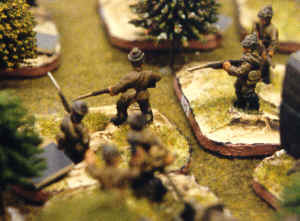 Megablitz is a set of operational-level wargames rules for 20th Century warfare. 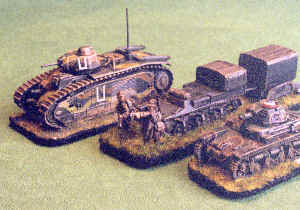 They were devised by Tim Gow so that wargamers could fight large, modern battles on a reasonable size wargames table. To find out more about Megablitz, visit the following pages of this website. To find out what has been recently added or changed on the website, visit the What is new? page. 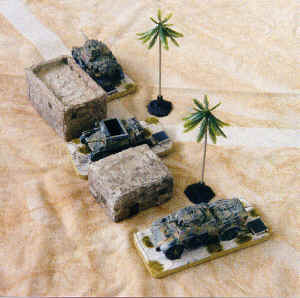 The playing pieces - model figures and vehicles mounted on stands - represent battalion-sized or regiment-sized units, depending upon the type of unit being represented. These units are allocated Strength Points (SP) which relate to each unit's type (e.g. Infantry, Cavalry, Armour), strength, equipment, and level of training. Strength Point markers are attached to the back of each stand, and are changed when the unit loses Strength Points as a result of combat. 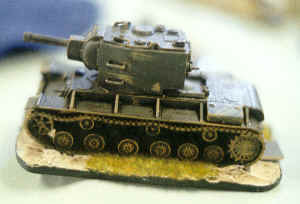 The ground scale used is very large (1:25,000 in games using 20 mm scale figures and vehicles and 1:50,000 in games using 1:300th scale figures and vehicles). The game moves represent two hours of actual time. It uses the SMART order chits system. It has a simple combat system that reflects each unit's strength and orders. Logistics and Supply are very important because without them units quickly lose the ability to fight. The main element of the Megablitz combat system is the Combat Matrix. Once units of opposing sides become involved in combat, each player counts the number of Strength Points that their units have. Each player then rolls the dice that they have been given in their Combat Box (a small box with a lid that can be fixed so that opposing players can not see the scores on the rolled dice), and the results are read off the Combat Matrix. The Combat Matrix shows the dice score required to inflict a casualty. Each player then adjusts their units' Strength Points accordingly. The main advantages of this system are that it is quick to use and it keeps the effects of combat secret from the opposition. There is a Megablitz discussion group at Yahoo! Groups. The figures and models featured in the photographs on this website are from the collections of John Armatys, Steve Briddon, Dr. Fred Cartwright, Bob Cordery, Ian Drury, Tim Gow, Nick Mitchell, and Chris Willey.